Two persons Ram and Raman can do a job in 32 days together. Raman can do the same job in 48 days alone. They started working together and after working 8 days Raman is replaced by a third person Rishabh whose efficiency is double that of Raman. 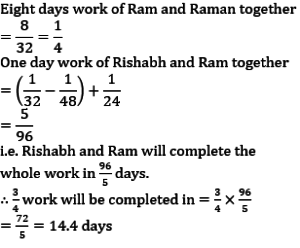 Find in how many days the remaining work will be completed by both Ram and Rishabh together? 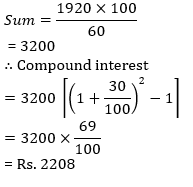 Simple interest on a certain sum at the rate of 15% per annum for 4 years is Rs.1920. What is the compound interest at the same sum at the rate of 30% for two years? In a bag there are four marbles of red colour and five marbles of blue colour. Two marbles are chosen randomly. What is the probability that both are of same colour ? The average of five consecutive odd numbers is 23.What is the difference between the squares of the second highest to second lowest number? 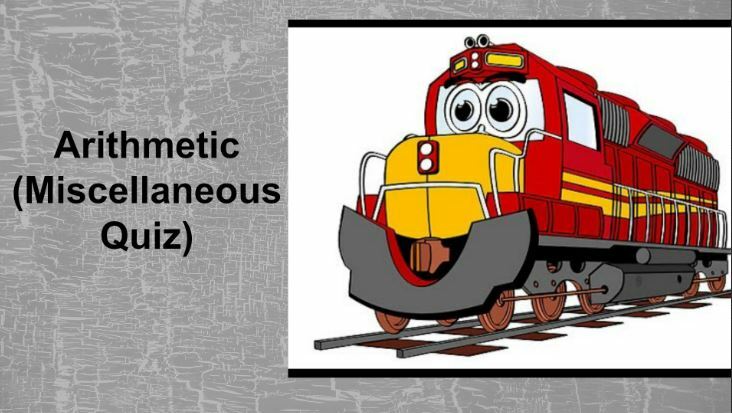 Two trains A and B cross the same platform in 18 and 24 seconds respectively. The respective length of trains A and B is 240 metres and 210 metres and the ratio of their speeds is 3:2. 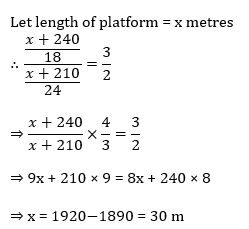 What is the length of platform? A dealer gives a discount of 25% on marked price of laptop. Ayush purchases a laptop from the dealer.After 1 year ayush sell laptop to raman at 10% profit. What is the marked price of laptop if Raman pay Rs.16500 to Ayush? The difference between present ages of Roshni and Simran is 9 years. After 7 years, Roshni’s age is twice of Simran’s age. What will be Roshni’s age after 4 years? Two persons P and Q enter into a business by investing their sum in the ratio of 7 : 9. After 7 months, Q leaves the business. After eleven month, if total profit is Rs. 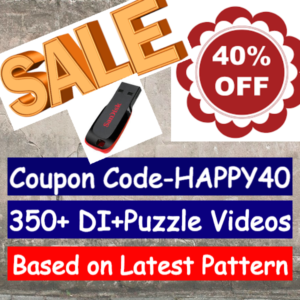 2460, what is the profit of Q? In a 54 litre mixture of spirit and water, the ratio of spirit to water is 4 : 5. 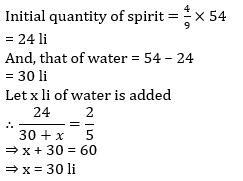 What amount of water should be added to this mixture to make the ratio of spirit to water 2 : 5 ?